The rush to hold a Monday hearing on Kavanaugh is "unfair" to his accuser, Democrats charge. 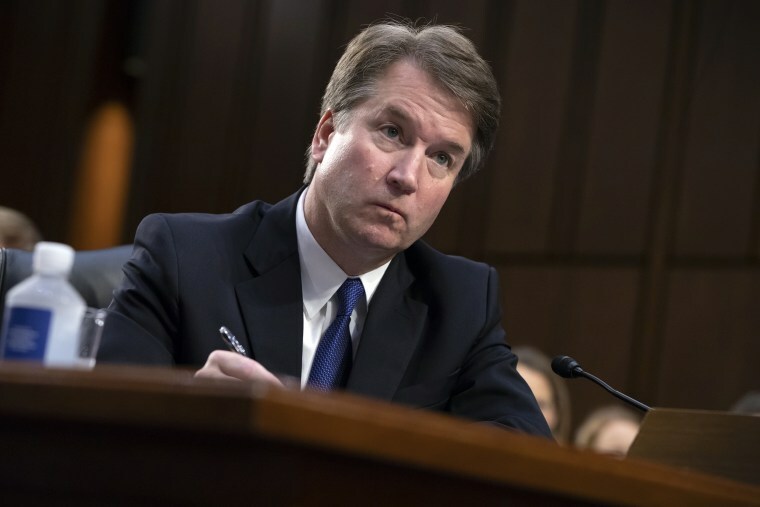 WASHINGTON — With a planned hearing to probe sexual assault allegation against Supreme Court nominee Brett Kavanaugh thrown into doubt late Tuesday, Democrats are warning that Republicans risk creating an atmosphere similar to the hostile environment that greeted Anita Hill’s testimony nearly three decades ago. It's an assertion also made by the attorneys for the accuser, Christine Blasey Ford, who say her life has been "turned upside down" since the allegation became public earlier this week and that she has been subjected to "vicious harassment and even death threats." In a letter responding to the Judiciary Committee's invitation to testify at a public hearing on Monday, the attorneys for Ford — who alleges that Kavanaugh assaulted her while the two were in high school — indicated she would not agree to attend the hearing under the current circumstances. Attorneys Debra Katz and Lisa Banks wrote that Ford was being asked to appear "in front of two dozen U.S. senators on national television to relive this traumatic and harrowing incident." "The hearing was scheduled for six short days from today and would include interrogation by Senators who appear to have made up their minds that she is 'mistaken' and 'mixed up,'" they added. That appeared to be a reference to Sen. Orrin Hatch, R-Utah, who told NBC News on Monday that after speaking with Kavanaugh, he thought Ford might be “mixed up” about her recollection. Kavanaugh "categorically" denies the accusation. Hatch's statement has been compared to similar things he said during the Hill hearings in 1991. Democrats say the letter, which is the first time Republican senators have heard from Ford since the request to testify was made on Monday, is further proof that Republicans are advancing a disadvantageous process for Ford. "I agree with her 100 percent that the rushed process to hold a hearing on Monday has been unfair and is reminiscent of the treatment of Anita Hill," Sen. Dianne Feinstein, ranking member of the Judiciary Committee, said in a statement. Even before Tuesday night's developments, both parties were already looking toward another dramatic hearing against a new backdrop of the#MeToo movement that has rocked industries across the nation in the past year. Republicans are cognizant of the optics from 27 years ago when Hill, a University of Oklahoma Law Professor, answered questions from an all-male committee that grilled her over lewd details of her accusations of sexual harassment against now-Supreme Court Justice Clarence Thomas. Sen. Bob Corker, R-Tenn., one of the handful of Republican members who pushed Republicans to re-open the hearings in light of Ford's allegations, said that the committee needs to set a tone of respect. But later on Tuesday, Corker tweeted that if Ford doesn't testify Monday, the Senate should vote on Kavanaugh. But Democrats say little has changed. They point to the terms originally offered by Republicans for Ford to testify as creating an environment similar to the one that greeted Hill. “She’s going to be put forward totally disadvantaged, being victimized, and it is totally reminiscent of Anita Hill,” said Sen. Mazie Hirono, D-Hawaii, and member of the Judiciary Committee said on Tuesday. Like Ford's attorneys, Democrats had been calling for the FBI to conduct a background investigation of the incident before any hearing, which, they say, would give members a basis for their questioning and possibly a corroboration of her account. President Donald Trump said earlier Tuesday that he won’t ask the FBI to do that. Democrats also said they wanted additional witnesses to testify, including his high school friend, Mark Judge, who Ford named as being the other person in the room. But Judge, through a letter by his attorney, said that he had no interest in testifying publicly. Meanwhile, Kavanaugh spent his second straight day at the White House strategizing how to move forward and preparing for public testimony on an accusation he denies. Democrats say that one week is not enough time for Ford to prepare for a public, televised testimony about an alleged traumatic experience. “You have the entire power of the White House behind Kavanagh. You see? Do you think that is an even situation? I don’t think so,” Hirono said. Republicans say they have offered a fair process and one that a handful of their concerned members demanded in order for them to even consider supporting Kavanaugh's confirmation after the release of the allegation — public testimony and under oath. Sen. Susan Collins, R-Maine, who does not sit on the Judiciary Committee, suggested in a letter to the Judiciary Committee that to level the playing field, Kavanaugh's and Ford's attorneys conduct the first round of questioning. Feinstein dismissed Collins' suggestion outright. Sen. Richard Durbin, D-Ill., a member of the Judiciary Committee, said Republicans are responsible for how this plays out.